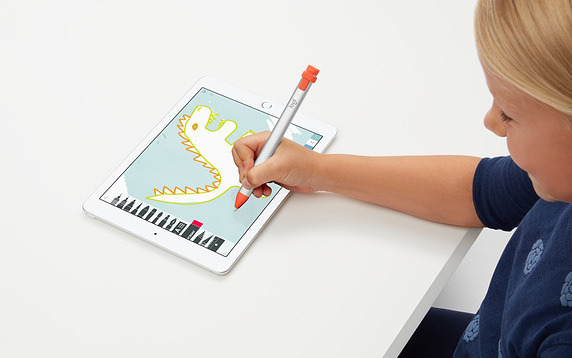 A product page for the Crayon lists the stylus as working with the new iPads, as well as 2018's "budget" iPad. It's incompatible with 2018 iPad Pros, however. The Crayon shares some features of the Pencil, such as automatic connection, palm rejection, and pressure sensitivity. Its main feature though is its price: $69.95, almost $30 less than the first-generation Pencil, and over $59 less than the second-gen model. The latter is intended for iPad Pros only. Missing from the Crayon are pressure sensitivity and the ability to tap its side for selecting different modes. The Crayon was originally launched a year ago as an education-only product. It took several months for sales to open up to the public. The updated Air and mini models are largely performance upgrades, with few feature or cosmetic changes. Enhancements include a larger 10.5-inch display on the Air, A12 processors, True Tone displays, up to 256 gigabytes of storage, and first-generation Apple Pencil support.